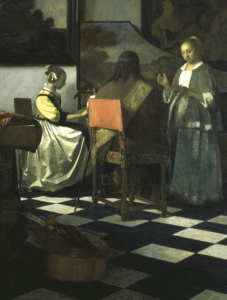 Trough the seasons 2017-2018 the Italian movie companies Sky Arts Production Hub and Ballandi Arts have created a TV co-production, a magnificent series of 50- minute programs about a number of important lost paintings. These programmes will be aired and marketed by Sky Arte. 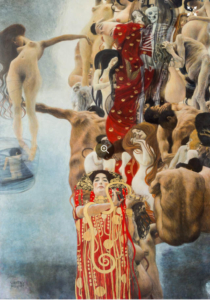 To the left is an exciting image of one programme in the series, a forever lost Gustav Klimt painting, an image formerly only known from a b/w photo, but now glorious resurrected in colour and in full size. Ballandi Arts camera teams shot footage of me in Delft and Madrid for this particular programme on Vermeer. 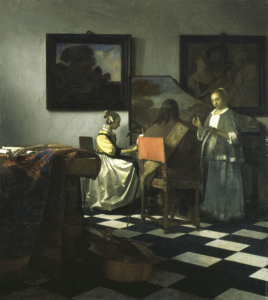 The Vermeer painting itself was stolen in 1990 from Boston, Isabella Stewart Gardner museum. Despite an enormous effort of the museum and authorities in the USA, the original valuable painting is still missing, which is a very very painful state of affairs! 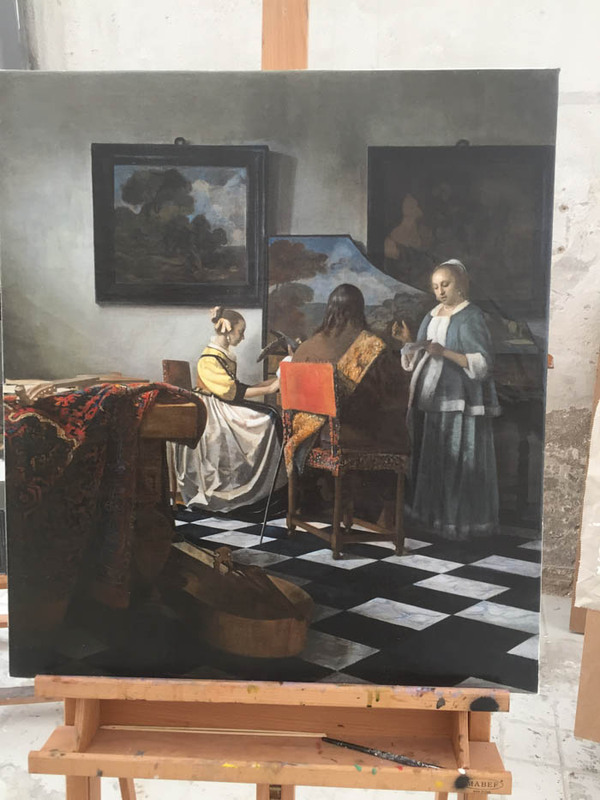 Rupert Edwards is the author of this 2018 Vermeer movie „Mystery of the Lost Vermeer” ; the film director is Giovanni Troilo. In the industrial outskirts of Madrid the large art factory-workshop Factum Arte, a 3D digital mediation studio, took all steps towards resurrection. They started with a faded colour photograph (see image on the left, on the floor) and worked parts of the colour and surface texture up in oil painting. 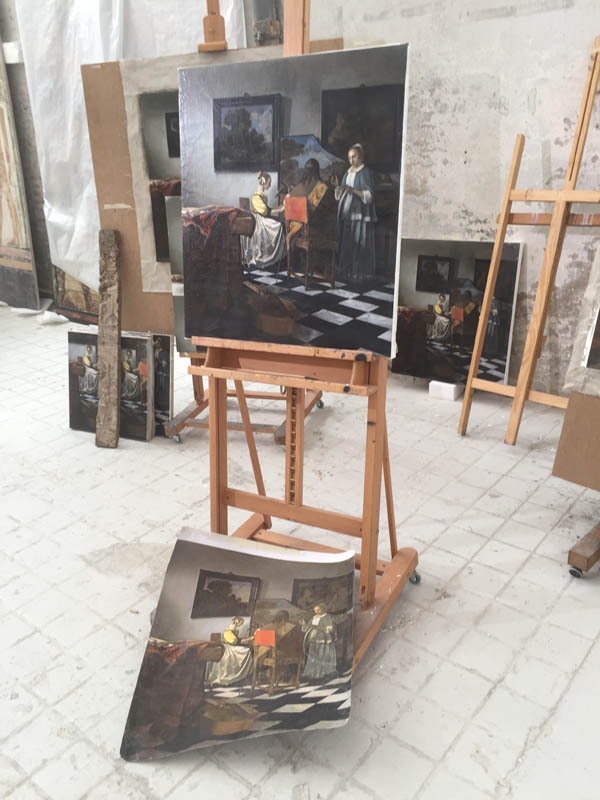 Expert painterly advice was gained from Jonathan Janson, painter and a very active Vermeer expert whose web site is Essentialvermeer.com. The painted results were digitally scanned and mastered into a digital format (a high-end industrial cousin of the photoshop programme) and stored in computer code for future fine-tuning. The result was then printed. The first layer put on the canvas/paper support was a chalky silicon texture layer. On top of that extremely high-quality ink jets were added many layers of colour. The result can be seen here in a number of still photographs shown here by the author. Both experts, Jonathan Janson and Kees Kaldenbach were invited to the workshop of Factum Arte in Madrid to witness (on-camera) the unveiling of the result. 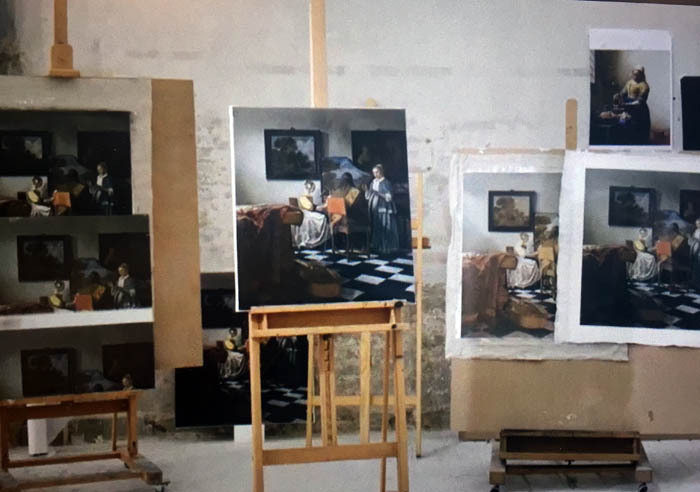 In the 2018 Vermeer movie „Mystery of the Lost Vermeer” their responses are presented. 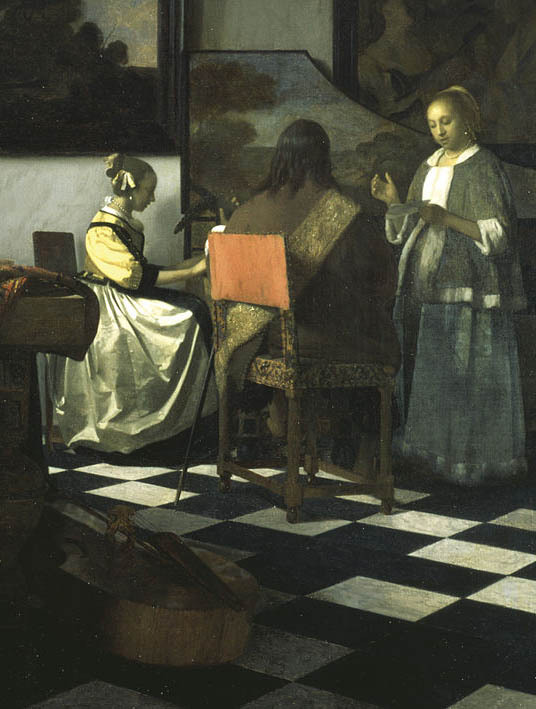 Presently, Kees Kaldenbach owns one copy of the high-end print of this painting on museum quality thick paper. 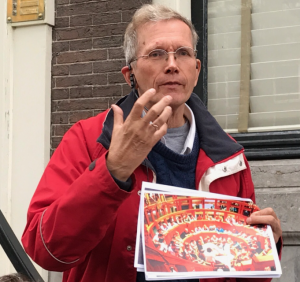 It can be studied in his home in Amsterdam, where he works as a high-end art history tour guide. Old photograph, the starting point of the resurrection. It is now found in Wiki. Someone has done LOT of photoshopping to upgrade it to what you see here. The REAL old faded photo is shown lying on the floor (see above). Detail, old photograph. It is now found in Wiki. Someone has done LOT of photoshopping to upgrade it to what you see here. The REAL old photo is shown on the floor (see above). 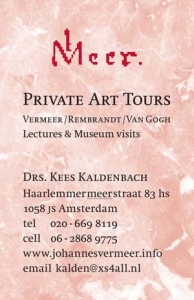 Lecture at home, or elsewhere, by Drs Kees Kaldenbach, a professional Art History scholar with excellent teaching skills. Specialist in Fine art and Design, Architecture and History. VIP entry. Standing by the home of Dr Tulp, the teacher in the Rembrandt’s Anatomy Lesson.